Twelve Years a Slave Actress Storm Reid is just 14, what Could her Net Worth be? 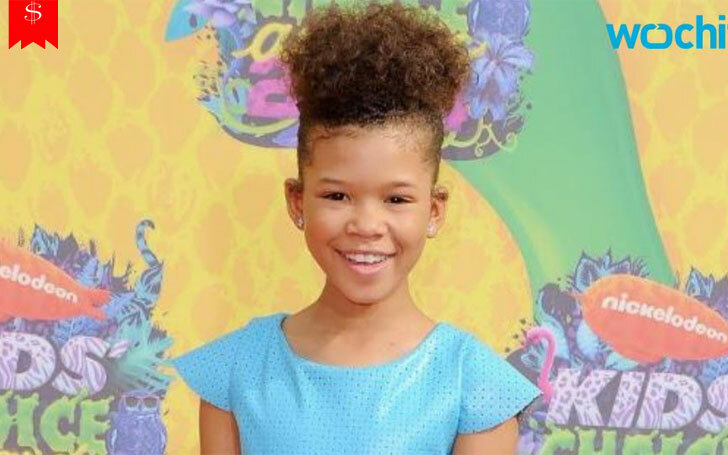 American born actress Storm Reid is just 14-year-old and has already established a name in the industry. The teenage actress is known for her role in The Thundermans, Adam DeVine's House Party, NCIS: Los Angeles and Chicago P.D. Reid has an average salary of $46,887 annually, but her net worth of 2018 is still under review. The budding actress recently played the role of Meg Murry alongside Oprah Winfrey, Reese Witherspoon, Mindy Kaling and others in the movie, A Wrinkle in Time. The film is based on the novel written by Madeleine L'Engle. To find out more about the net worth and career of Storm Reid, continue on reading. As mentioned earlier, the net worth of Storm Reid hasn't been disclosed, but taking a note on her five figured annual salary, her net worth might be around in million dollars. Most of the movies in which Strom has acted are massive hits. However, her recent movie A Wrinkle in Time, which was created on the budget of $100 million grossed just $71.7 million at the box office. On its release date, the movie collected $10.2 million. Likewise, her movies 12 Years a Slave and Sleight collected $187.7 million and $4 million at the box office. She also earns a decent amount of salary from her appearance on television series. She has appeared in TV series like The Thundermans, Adam DeVine's House Party, NCIS: Los Angeles and others. Strom owns customized STORM Nike shoes and was gifted bag by Louis Vuitton for her notable performance in A Wrinkle in Time. The congratulations, love, encouragement and gifts are still coming for booking the lead role in "A Wrinkle in Time". Thank you so much auntie Faula. I feel so blessed and loved. #ImBlessed #HappyGirl #Thankful #DoWhatYouLove?? She also has a pet toy red poodle named Cayenne which cost $2000. At the age of 3, Reid began her baby steps in the field of acting. Her debut movie The Girls of Summer released in 2012. In the same year, she also performed the role of Young Erica in A Cross to Bear. After doing several small roles in movies and series, she got her breakthrough from the movie 12 Years a Slave. Strom acted as Emily alongside the leading character portrayed by Chiwetel Ejiofor, and Brad Pitt, Alfre Woodard, Paul Dano in supporting roles. She also starred in the American science fiction drama film Sleight, released on April 28, 2017. The movie stars Jacob Latimore, Seychelle Gabriel, Dulé Hill, Sasheer Zamata, Michael Villar. In later years, she acted on Lea to the Rescue, Santa's Boot Camp, A Happening of Monumental Proportions and A Wrinkle in Time. Though just a teenager, Reid has an amazing career, and her two new movies are scheduled to release this year. She will appear with Danny Glover and Jon Heder in Killing Winston Jones directed by Joel David Moore and also in an American science fiction horror film, Only You. Hope the actress' future movies will be a huge success, and she will become one of the biggest stars in the Hollywood industry.